ABUJA—GOVERNOR Samuel Ortom of Benue State, yesterday, said that no amount of opposition and intimidation will stop the implementation of the anti-grazing law in the state, starting November 1. Governor Ortom added that he had directed security operatives to deal with those behind the threat to resist the implementation, even as he called for the arrest of the leadership of the Fulani socio-cultural association, Miyetti Allah Kauta. Ortom disclosed this to newsmen after a closed-door meeting with President Muhammadu Buhari at the Presidential Villa, Abuja. He also said that he briefed the President about the ecological problems in Benue State and his major challenge—payment of salaries— which he said was not deliberate as he had not diverted money: whether bail out or Paris Club refunds. “Those who want to stay in Benue State and do cattle business must ranch their cattle. This is what we are saying. As far as we are concerned, the law is not targeted at any individual, group of people or any ethnic group. It is meant to protect everyone living in Benue State. “Miyetti Allah has taken us to court and we are there with them. But I do not see how they will come and over run Benue and make it ungovernable— it is unacceptable. “If you want to bring confusion, I want to assure you that I have directed the security men to arrest those people. I am calling for the arrest of the leadership of Miyetti Allah, to be prosecuted to serve as a deterrent. The governor said he has made land available for ranches and asked interested persons to apply. 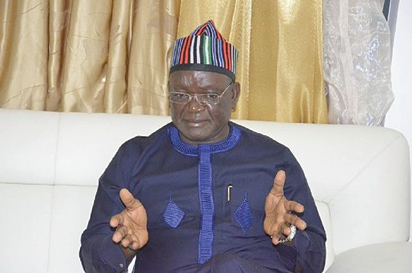 The post Nobody can stop implementation of grazing law—Gov Ortom appeared first on Vanguard News.